QCA is extremely pleased to announce today a new partnership with the wonderful folks, two-legged and four-legged, at Greyhound Compassion. A rescued racer from Nottingham track, Magic was adopted by one of the GC Trustees a couple of years ago. He finished racing one Saturday night in March 2016 at the age of 5, having raced 120 times. Now he’s a firm favourite on a different circuit – spreading the word about the plight of racing greyhounds and fund-raising for those less fortunate than him. So far this year he has given a talk to his local Women’s Institute, presided at the Greyhound Compassion fun dog show (he left the judging to the judge), and has been an Ambassador for many less fortunate greyhounds at 7 Greyhound Compassion flag days. These “meet and greets” are a good way of spreading the word about the vast numbers of greyhounds needing homes and talking to the public about the greyhound racing. They are often surprised that greyhounds race from morning until night so that racing can be streamed to high street bookies and around the internet. The other disturbing fact is that the racing industry published its injury and end of life stats for the first time this year and revealed that 1,013 racing greyhounds were put to sleep or suffered sudden/natural death in 2017, 25% of which took place at the track. There were 4,837 injuries last year. Magic’s next set of diary engagements will now embrace his new role for QCA – he is to be an official “Ambassador” for greyhounds at Greyhound Compassion’s events and QCA will report on his activities from time to time and contribute to Greyhound Compassion’s charitable projects where possible. These include funds towards subsistence, vet care and kennel maintenance for greyhounds and galgos at Greyhound Rescue (Lincolnshire), Protectora y Santuario Scooby and Limerick Animal Welfare. Magic’s calendar over the next few weeks includes Greyhound Compassion flag days on 25 August in Welwyn Garden City and on 8 September in Hertford. However, his biggest engagement this summer will be the Greyhound Rescue Sponsored Walk in Pinewoods, Woodhall Spa, Lincolnshire, in memory of Freya. Freya was rescued from greyhound racing a few years ago. She suffered a terrible trauma while racing which meant she could not be homed from the Lincolnshire shelter. One attempt at homing didn’t work out, devastating her adopted family, but it wasn’t to be. Instead she lived her life out at the shelter where she came to trust her carers. She played happily with them but could not face the rest of the world. Sadly she passed away last year. 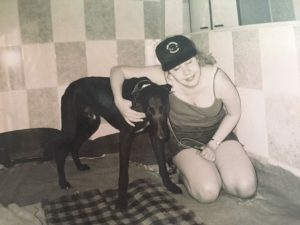 Now Greyhound Rescue is holding a sponsored walk or walk for a donation in her memory. The second aspect of our relationship with Greyhound Compassion is about support for a special galgo – Brisa. Brisa was rescued earlier this year as part of a pack of hunting dogs of various breeds including beagles, bassets, fox hounds, terriers, galgos and dogo argentinos. These dogs were rented out to hunters on their boar hunting excursions. Protectora y Santuario Scooby, one of Greyhound Compassion’s supported shelters, rescued all of the 36 dogs from circumstances of appalling neglect and abuse. Scooby is now appealing for funds to cover the veterinary treatment for the dogs and the costs of mounting a legal case against the perpetrator of the cruelty. A previous prosecution brought by Scooby against an owner of neglected horses and donkeys resulted in a 6 month suspended jail sentence and prohibition from owning animals for 2 years. We hope Scooby will be successful in this latest case too. Brisa is an older lady from the pack and is now living with Fermin Perez of Scooby in special care at his home. The court has placed her in Fermin’s care while the formal complaint is completed. Although Brisa has made progress, she does have Ehrlichiosis and this needs regular treatment with antibiotics (doxycyclilne). Eventually, when she is fit and after the court case, Scooby will be able to spay her. QCA will be contributing to the costs of her care. Although Brisa shows signs of having been a keen hunting dog, she is adjusting to living with the rescued geese and ducks and other animals at Scooby. She is very sweet, quiet, patient and walks obediently by Fermin’s side. She doesn’t have an aggressive bone in her body and the relief she feels to be comfortable, safe and secure is immense. QCA is grateful for the support QCA members have shown for Scooby and GC over the years. It’s our members’ caring and compassion that has led us to form this partnership. Please click photo below to read QCA member Jo Hill’s story. I did … sense that the work that was being done to help the dogs and cats at Scooby had a spiritual dimension.